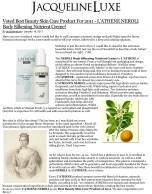 Voted L'ATHENE Best Beauty Skin Care Product. L'ATHENE - These amazing products not only leave skin soft and touchable, they also help to prevent wrinkles. PRIMESSE - This all-in-one cleanser dissolves impurities, make-up and excess oil... without detergents. Each L'ATHENE product contains a blend of vitamins, minerals, proteins and fatty acids in a pure, bioactive form for healthy skin. 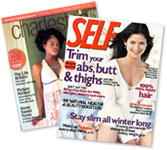 My favorite product is the VITAPURE Antioxidant Serum. I can instantly feel the difference. Skin responds best to pure, potent, nutrient-rich natural preparations. Can be used on minor burns or sunburned skin. What they (L'ATHENE) don't put in their products is as important as what they do! Does your skin need a boost? Well, I have just the product for you! L'ATHENE: Skin care that packs a 99% chemical-free punch. Even has anitoxidant protection. For use following the post-op program, when your skin is ready for skin care products. Helps minimize signs of aging. L'ATHENE brings everything the skin needs for maximum health and radiant beauty. Nan and Lil created L'ATHENE to produce quick, noticeable results. Triple antioxidant potency of Vitamin E, Echineacea and Rose Hips restores skin balance and gives anti-aging protection. Americans are seeing the correlation between food they eat and health, and the products they use on their skin. L'ATHENE packs a 99% chemical-free punch. If you can't find it, why not invent it? That's just what two registered nurses did. Most facial cleansers are loaded with chemicals, part of the reason some of them fail so badly. For MEN too, for healthy great-looking skin. 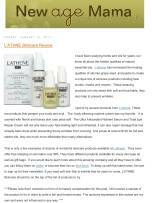 L'ATHENE skincare is about noticeable quick results of younger-looking skin. Packed with proteins, fatty acids, antioxidants and vitamins for intense hydration and protection from external elements.